THE IRISH GOVERNMENT has said it does not recognise Catalan’s declaration of independence as Spain moved in today to assert direct control over the region. 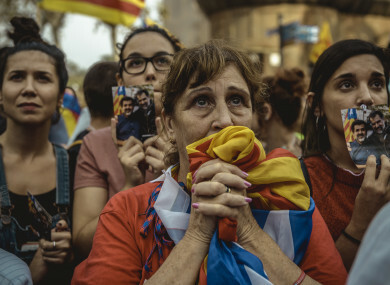 Last night Madrid announced it would call a snap Catalan election in December and dissolved the current parliament, which had voted in favour of a declaration of independence. “We are all concerned about the crisis in Catalonia. Ireland respects the constitutional and territorial integrity of Spain and we do not accept or recognise the Catalan Unilateral Declaration of Independence,” Ireland’s Department of Foreign Affairs said in a statement today. But Sinn Féin want the Catalan Parliament to be recognised by the Irish government. Its MEP Matt Carthy said that the Department of Foreign Affairs’ refusal to acknowledge the wishes of the people of Catalonia as “a travesty”. “The right of nations to self-determination is fundamental and is a key point of international law. In 1919 when Dáil Éireann declared independence for Ireland not a single state recognised the Irish republic which the British declared illegal. What resulted was war, division and the partition of Ireland. He urged Taoiseach Leo Varadkar to encourage the Spanish Prime Minister to engage with Catalonia’s representatives. All eyes now will be on regional leader Carles Puigdemont and his team to see if they will willingly step aside for caretaker envoys from Madrid. Email “Sinn Féin calls on Irish government to recognise Catalan independence”. Feedback on “Sinn Féin calls on Irish government to recognise Catalan independence”.